This year Andrea has been chosen to take part in BAFTA crew which will provide numerous networking opportunities and mentoring from BAFTA members. She has just finished scoring her second feature film Catskin, having previously scored ‘The Devil’s Rock’ (NZ film council, special FX by WETA workshop). The beginning of the year was spent at the Warner Bros. Eastwood scoring stage recording and conducting four of her own pieces. 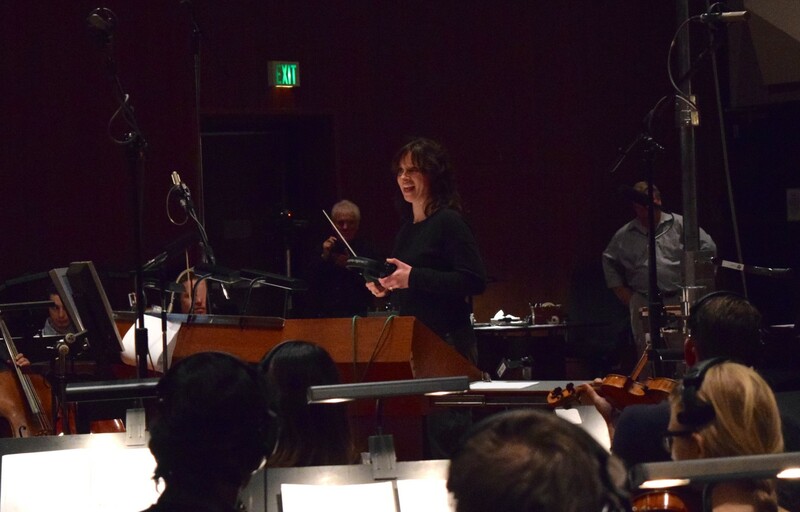 Andrea composed, orchestrated, prepared the score, parts and click tracks for the 62 piece orchestra. In this last year Andrea’s music has appeared in TV show’s like ‘About A Boy’ (NBC),‘Keeping up with the Kardashians’ 4music (Worldwide), ‘Building Dream Homes’ (ITV), ’Come Dine with Me’ (Channel 4), ‘This Morning’ (ITV), ‘Bad Robots’ (Channel 4) and ‘Tales of Northumberland’ with Robson Green’ ITV. Apart from being a super talented composer Andrea is a beautiful human being. Her patience and perseverance brought Obligate Symbiosis a truly amazing score. A real pleasure working with her! Andrea is a pleasure to work with. She scored two films of mine, the short film Night of the Hell Hamsters and the feature film The Devil’s Rock and nailed the mood and tone perfectly. She’s a wonderful collaborator and I’d heartily recommend her. Andrea elevated my short film ‘Animal’ immensely with her score, which was completed quickly and to the best possible quality. A wonderful collaborator and incredibly talented composer, and I would highly recommend her to anyone. Andrea scored two of our most popular apps, Timedancer and Zombies Ate My City. She managed to capture the mood of these two very different games, creating music that is catchy, memorable, and iconic. When it comes to the symphonic orchestra and symphonic-style orchestration, Andrea always finds the right notes. Talented, dedicated, and industrious, I have no doubt she’ll realize her music career aims. Andrea is an exceptionally talented composer and orchestrator. She is cheerful, reliable and creative with a boundless enthusiasm for whatever the task at hand might be. I would have no hesitation in recommending her as an orchestrator and would be delighted to work with her on our own orchestral sessions in the future. Andrea brings a fresh sounding energy to the ﬁlm composing world and is sure to be a strong force in the industry. Not only a great composer but a true artisan in the craft of orchestration.